As editors, we shop quite a bit. 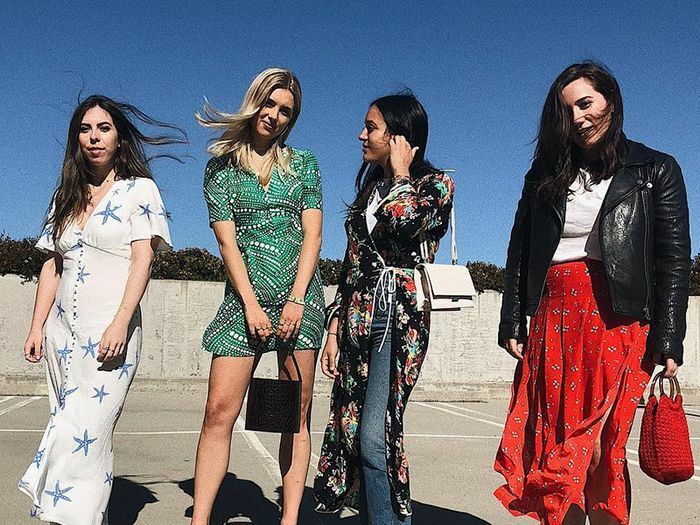 Whether we're hunting down the cutest clothes on all the internet for our stories or discovering new up-and-coming brands before anyone else, it's safe to say that, as a team, we've collectively seen hundreds and hundreds of fashion items. Case in point: everything in Kat's epic 98-item shopping cart. So take it from us when we proudly stand behind the following items. These are the ones that have made our outfits exponentially more stylish—we're deeming them the best clothes we own. Go on to see for yourself what we're absolutely over the moon about, and if you're so inclined, shop our recommendations. Each one of us can personally attest that these are purchases you won't regret making. Happy shopping! I just got these jeans, and they have already transformed my denim game. The rise hits the perfect spot, making me appear slimmer through the hips, and the wash is absolutely timeless. I've worn this belt for years now, and it always makes my outfit look more expensive. This dress is a straight-up showstopper. My fancy dress game was subpar, and now whenever I have an elevated event to attend, I can count on this number to come through. Timeless, yet trend-aware. What more could you want from your jewelry? I love that I can wear these threaded through a single hole or can show off my double piercing by pulling it through both. I honestly have no clue why these are on sale. They're the perfect '90s shoes, without actually having to go to vintage footwear, which can feel a tad gross, depending on where you source them from. Also, did I mention they feel like walking on clouds? I've never seen an anklet quite like this before. It's elegant, yet cool. Something I could picture Ashley Olsen in, which to me, is perhaps the highest compliment. I'm not into the full-out logomania look, but this subtle belt feels classic yet of-the-moment. This bag touches on so many 2018 trends. I've yet to find a pair of jeans that makes me feel cooler than these do. I've worn these boots more times than I can count. I love that they're classic but still a little tough. You can't escape Réalisation's slip skirts right now, and that's fine by me. These cool mixed-metal earrings have quickly become my go-to pair. I added this Cinco necklace to my collection, and is my way of embracing the seashell jewelry trend. By Far is my new favorite shoe brand for everyday block heels. I actually own these in red, but they are currently sold out. I recently added this printed number to my dress collection, and I already can't wait to wear it again. When I'm not layering on my gold necklaces from Cinco, I swap in these classic silver hoops for a fresh look. I get so many compliments on this $26 bag, and it's become my go-to this summer. From styling with a bikini to a simple denim look, chain belts have become a popular accessory in my summer wardrobe. These low-heeled sandals go with everything a typical pair of jeans would but make your outfit feel a little more style-forward. They just give every outfit a more polished look than a flat would. I've been wearing either a gold or crystal belt with everything lately. I love how they not only help define your waist but add to your overall look. A sleek statement bag makes even the simplest outfits exciting. I never take off my layered necklaces, ensuring I'm always accessorized. Since my obsession with denim jackets started years ago, I think I've acquired about 10 of them. I love how you can tie one around your waist or wear it over your shoulders to give any outfit a "third piece." Plus, they work in any season. Available in French sizes 36 to 40. I love a good statement top to make jeans feel fancier. This pretty Silvia Tcherassi one can be easily layered over a T-shirt or turtleneck to make it work year-round. How pretty is this Manu Atelier bag? The perfect one-and-done summer dress. I never say no to a good plaid coat. I love plain white tees, but this cute cropped version with the Fila logo mixes it up a bit. These sleek sandals make any outfit, no matter how casual, feel ultra luxe. I love how this bag feels more elevated than the normal straw trend thanks to the black color. Oversize blazers like this one thrown over your shoulders add that sometimes-needed third piece sans the fuss. Pretty sure these earrings' sole purpose is to make any outfit better. Boring outfits are easily upgraded with you put these babies on. Whether at the beach over a swimsuit or thrown on over a silk slip dress, chain belts add that festive, edgy kick. A sleek pair of mule loafers dress up every outfit. Cool sunglasses transform every outfit. While skinny jeans are a staple, I love how different a pair of cargo-inspired jeans feels. I love the look of a good romantic top. This sleek bag has made every outfit of mine 100% cooler since owning it. A top that says "I'm not a regular white top, I'm a cool white top." These modern art–inspired earrings are always a conversation starter. The square toe gives off a '90s vibe that feels so right for 2018. I recently added this sheer top to my closet, and it's making me crave colder weather so I can start layering with it. I finally found the perfect relaxed fit with this pair, and I love how the button fly adds a little something special. Next up: Five trends that never die, according to three generations of women.